"Austin 1800" and "Morris 1800" redirect here. For the successor to this model, initially carrying the same badges, see Princess (car). The BMC ADO17 is the model code that was used by the British Motor Corporation (BMC) for a range of cars produced from September 1964 to 1975 and sold initially under its Austin marque as the Austin 1800. The car was also sold by Morris as the Morris 1800 and by Wolseley as the Wolseley 18/85, and later as the Austin 2200, Morris 2200 and Wolseley Six. 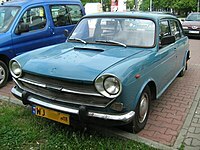 In Denmark it was sold as the Morris Monaco. Colloquially known as the "Landcrab", the 1800 was voted Europe's Car of the Year for 1965 – the second year of the award, and a second successive contest win for the UK, the Rover P6 having won the award a year earlier. 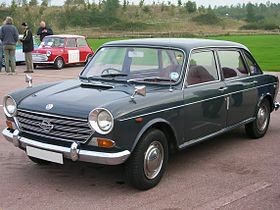 The Austin 1800 was developed at BMC as the large-car follow-up to the successful Mini and Austin 1100 under the ADO17 codename, ADO being an abbreviation for Amalgamated Drawing Office. Additional badge-engineered Morris 1800 and Wolseley 18/85 variants were launched in 1966 and 1967 respectively, catering for BMC dealerships selling these marques, and their loyal customers. The 18/85 name had previously been used on the Wolseley 18/85 of 1938 to 1948. The car was unconventional in its appearance in 1964, with its large glasshouse and spacious, minimalist interior including leather, wood, and chrome features plus an unusual instrument display with ribbon speedometer and green indicator light on the end of the indicator stalk. There was a chrome "umbrella handle" handbrake under the dashboard parcel shelf, and the two front seats met in the middle and could be used, on occasion, as a bench seat. Both Alec Issigonis and Pininfarina worked on its exterior. The technology "under the skin" was also unconventional and ahead of its time, including Hydrolastic suspension and an example of inertia-controlled brake proportioning, in the form of a valve which transferred braking force between front and rear axles as a function of sensed deceleration rather than as a function of fluid pressure. An interesting feature was a tail/brake/indicator night dipping system. A resistance circuit was connected in such a way so that when the sidelight circuit was energised the resistors dimmed the tail/brake/indicator lights so not to blind or dazzle following drivers. The bodyshell was exceptionally stiff with a torsional rigidity of 18032 Nm/degree, this was greater structural rigidity than many modern cars up to the end of the century. Progressive improvement was a feature of most cars in this period, but the number and nature of the changes affecting the early years of the Austin 1800 looked to some as though the car had been introduced without sufficient development work. A month after its launch, in December 1964, reclining front seats and the option of an arm rest in the middle of the back seat were added to the specification schedule. A month later, in January 1965, the final drive ratio reverted to the 3.88:1 value used in the prototype, from the 4.2:1 ratio applied at launch: this was described as a response to "oil-consumption problems": January 1965 also saw the indicator switch modified. At the same time, higher gearing and reduced valve clearances cut the published power output by 2 bhp but cured the "valve-crash" reported by some buyers when approaching top speed on one of Britain's recently constructed motorways. The manufacturer quietly replaced the "flexible, flat-section dipstick" which, it was said, had caused inattentive owners to overfill the sump after inserting the dipstick back to front so that the word "Oil" could not be seen on it. Subsequent modifications included changing, repositioning and re-angling the handbrake in October 1965, removing the rear anti-roll bar and rearranging the rear suspension at the end of 1965, at the same time adjusting the steering to address a problem of tyre scuffing, and fitting stronger engine side covers in January 1966 along with modified engine-mounting rubbers which now were "resistant to de-bonding". February 1965 saw water shields fitted to the rear hubs and the car's steering rattle cured by the judicious fitting of a spacer, while the propensity of early cars to jump out of first and second gears was addressed by the fitting of a "synchroniser". Further improvements followed the launch of the Morris 1800 early in 1966. Gear cables were revamped to deal with "difficult engagement" of first and third gears in cold weather, and the seat mountings were adapted to increase rake in May 1966. In June 1967, without any fanfare or press releases, a modified version of the 1800 started turning up in domestic market show rooms with repositioned heater controls, a strip of 'walnut veneer' on the fascia and separate bucket seats replacing the former split bench seat at the front. Various other criticisms seem to have been quietly addressed at the same time, including the announcement of more highly geared steering which now needed only 3.75 rather than 4.2 turns between locks, although the actual modification had applied to cars produced since September 1966 (and, in the case of Australian cars, some time before that). This was also the point at which the car received a differently calibrated dipstick, giving rise to rumours that engine problems on some of the early models had resulted from nothing more complicated than the wrong calibration of the dipstick, causing the cars to run with the wrong level of engine oil; the manufacturers insisted that the "recalibration" of the dipstick was one of several (unspecified) modifications, and urged owners not to use the new dipsticks with older engines. The 'Landcrab' nickname came from the car's unusual proportions, being much wider and lower than most other cars in its class, and its great structural strength. The car's successful outings on overland endurance rallies came about because, while it was never a particularly fast car its strong bodyshell and sophisticated suspension allowed it to reliably maintain competitive average speeds over a long distances on poor roads. The car's stance, strength and slow but sure nature over rough ground put the BMC rally crews in mind of a terrestrial crab. The nickname stuck and then became widespread in the press and public. 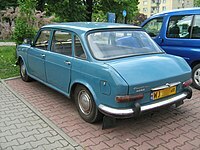 The Mark I's doors were later used on the Austin Maxi and larger Austin 3-Litre (ADO61) model. 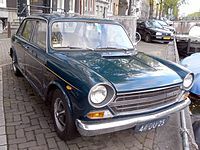 In 1969, the sills and doors from the 1800 (with Mark II exterior handles) were used on the bodyshell of the otherwise new Austin Maxi; apart from that, both models have little interchangeability. The 1800S twin carburettor 95 bhp engine came in from October 1968. By 1970, a 97 bhp (72 kW) "S" model with twin SU HS6 carburettors, a 120 mph speedometer and sporty-looking badging was available. Further, less dramatic modifications heralded a Mark III version in 1972. This had another change to the front grille (now a shared style for the Austin and Morris) and interior improvements, including a conventional floor-mounted handbrake. At this point, six-cylinder versions were introduced – the Austin 2200, Morris 2200 and Wolseley Six. While 1800 versions of the Austin and Morris were continued, the Wolseley 18/85 was dropped. The 2.2-litre straight-six engine used in the Australian Austin Tasman & Kimberley "X6" cars was introduced into the British ADO17 range in 1972. The British 6-cylinder models were marketed as the Austin 2200, Morris 2200 and Wolseley Six. The ubiquitous doors even appeared on the further upmarket Austin 3-Litre of 1968 and, at prototype stage, Bentleys and Rolls-Royces. Some 386,000 examples of all variants were produced in just over a decade, with the Austin-badged versions being the most common; some 221,000 units were produced. There were 95,271 Morris 1800 and 35,597 Wolseley 18/85 produced in the UK. Relatively few have survived outside the hands of enthusiasts owing to its original unfashionable image, and more recently, its popularity in the demolition derby and banger racing scenes, owing to the bodyshell's exceptional strength and rigidity. 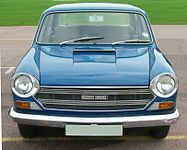 In early 1975, all three models were replaced by the wedge-shaped ADO71, or 18–22 series, which bore the Austin and Morris (1800 and 2200) names, while the Wolseley variant had no official model name save for being marketed as "the Wolseley saloon". From late 1975 all ADO71 models were marketed under the Princess name and the Wolseley marque was discontinued. The model proved a strong competitor in endurance rallying, finishing second in the 1968 London-Sydney Marathon and achieving three of the top 20 positions in the 1970 London to Mexico World Cup Rally. In later life, the ADO17 became a popular car for competing in banger racing and in demolition derbies owing to the bodyshell's legendary strength which made it ideal for those sports. By 1966 Australia was described as BMC's leading world market. The 1800 was introduced in Australia in November 1965 as the Austin 1800, with a Mark II version being introduced in 1968. Australian-produced vehicles started out with a claimed local content of 65–70% along with an undertaking from the manufacturers to raise the level to 95% in line with government requirements by the end of 1968. Initially the cars were generally identical to their British contemporaries, however the local production was quickly modified to suit the harsher roads and climate of Australia. Modifications to the British Mark I design included raised suspension trim height, the provision of a large, heavy sump guard and better sealing against dust. The Australian Mark II was notable in retaining the lower final drive ratio of the Mark I's manual transmission (but not the lower second gear), and, with the exception of the initial production run, was fitted with a dual-circuit hydraulic braking system manufactured locally by Paton's Brake Replacements (PBR) Pty. Ltd. Despite offering the safety of a dual-circuit system, it was generally held to be inferior in performance to the earlier Girling equipment. The Australian Mark II was also originally fitted with an alternator manufactured locally by Electricity Meter & Allied Industries Limited (EMAIL), a company better known for its kilowatt-hour meters and household appliances. In the event of failure, most EMAIL alternators were replaced by Australian-made Lucas units. 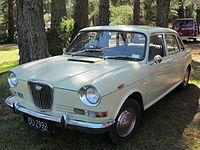 A version unique to Australia was the Austin 1800 Utility, a coupe utility produced from 1968 to 1971. Over 2,000 examples were built. The Utility was released near the end of the first series in July 1968 and most of the examples produced were therefore Mk IIs. A cab chassis variant was also offered. The 1800 Utility was given the model code YDO10. Per capita, the Australian model sold better than anywhere else in the world. Ironically, it represented the tail-end of popularity of British-designed cars in Australia. In the Australian market, it offered a roomy and advanced 4-cylinder alternative to the popular 6-cylinder models such as the Holden Kingswood, which used conventional engineering based on American principles. Some versions badged BMC Freeway (a name previously used for a six-cylinder Farina model in Australia) were exported to New Zealand, which also assembled UK-made Austin and Morris 1800s in separate plants. As a one-off engineering prototype, to test production viability - an Australian 1800 Mark II body with subtly extended front guards and modified front internal structure was fitted with an early Rover 3.5 litre V8 mounted in the "North-South" position in the engine bay and then through a complex mechanical system, drove a heavily modified version of an "East-West" mounted Borg Warner 3 speed automatic gearbox and Austin FWD differential. This car became Australia’s first locally made FWD V8 car. The car was built by BLMC (Australia) at its Victoria Park works at Zetland, New South Wales. Mass production costs and general viability of the V8 "1800" were felt to be excessive and the project shelved in preference to the Australian Leyland P76 project. Some reports state that the vehicle was eventually shipped to British Leyland in the UK and never seen again while others claim it was simply broken up at the end of its testing by Leyland Australia. In 1970, the Australian subsidiary of BL replaced the 1800 with the modified and facelifted "X6" models known as the Austin Tasman and the more upmarket Austin Kimberley .These cars featured new front and rear styling and a 2.2-litre 6-cylinder version of the E series OHC four-cylinder engine (becoming one of the first front wheel drive cars with a transversely mounted "inline" six cylinder engine). Both models had an updated dashboard and interior but retained the "bus" like steering wheel position and gearshift approach from the 1800. The MkI Kimberly had a higher power engine fitted with twin SU carburettors (MkII’s reverted to single carburettors like the Tasman). The X6 series was intended to compete more effectively with the Australian-assembled rear-wheel drive six-cylinder family cars of GM Holden, Ford and Chrysler Australia. Both of the Austin cars were offered with either 4 speed manuals or a 3 speed automatic. Mark II versions of both X6 models were introduced in 1971. The X6 Tasman and Kimberley models were given a model designation code of YDO13 with the Mark II models coded YDO19. Despite their technical superiority, updated styling, good ride, comfort, interior space and adequate power the "X6" series were somewhat underdeveloped due to a limited budget and so became ultimately commercially inferior to their competitors – eventually being superseded by the Leyland P76 in 1973. Local distributor New Zealand Motor Corporation initially imported the Australian Tasman and Kimberley models from Zetland but later assembled most of its stock from CKD kits at its Petone plant near Wellington. The Kiwi cars had different interior trim materials as part of the 40-50% local parts content common at the time but otherwise differed only in detail from Australian made cars. They were, however, sold as Morris models instead of Austin. Eventually – by 1973, Leyland Australia had modified the L6 engine and extended the stroke of the 2200 motor to 2600 cc for final use in the Leyland P76 and L6 Marina models. ^ "Previous winners" (in Spanish). Car of the year. Retrieved 28 August 2012. ^ a b c d e f g h i j k l m "Spot check: BLMC 1800". Motor: 22–24. 14 February 1970. ^ a b "News and Views: New trim for BMC 1800". Autocar. 126 (nbr 3724): 58. 29 June 1967. ^ "News and Views: Austin 1800 assessment". Autocar. 127 (nbr 3730): 49. 10 August 1967. ^ "Mark II BMC 1800s". Autocar. 128 (nbr3768): 16. 2 May 1968. ^ "Production Information". Landcrab.net. 22 November 1965. Retrieved 28 August 2012. ^ a b c "News and views: Austin 1800 in Australia". Autocar. 125 (nbr 3697): 341. 23 December 1966. M Sedgwick & Gillies M, revised by J Pressnell (1997) . Classic and Sports Car Magazine A-Z of Cars 1945–1970. Bay View Books. ISBN 1-870979-39-7. Wikimedia Commons has media related to BMC ADO17. Adams, Keith. "The Unofficial Austin Rover web resource – ADO17 development". Archived from the original on 19 March 2006.